Tycho Varga was born to his mother, Ziris, and his father Titus. He was born on Corellia in a small farming town far away from any major cities. This also meant they were far away from the local security forces, and the Corellian Exchange owned the entire village. They used the town as a place to hide away illegal cargo, as well as extort the local populace for credits. They claimed it was in the name of protection, but the only people they needed protection from is the Exchange itself. If people didn’t pay up, then the Exchange would pay them a little visit. And Tycho was born with a special ability, or curse depending on your point of view. He was born with a rare force ability known as Force Empathy. The boy has been able to feel physical and emotional pain of people. Especially those he’s close to. His parents always kept him sheltered as best as they could from the events going on in the village when they happened, he just knew the exchange as people who came to take money from his parents. But when they paid a visit to people who were unable to pay, Tycho would feel the pain and distress the others felt. He never knew why he did, his parents not knowing either. But the next day, Tycho would always seek out the people he sensed and what he could to make them feel better. Once he learned how to walk, of course. If it was emotional sadness, he’d give them a hug. If they were in pain, he’d show up with a bandage and give it to them. A lot of people would begin to distance themselves from the Varga family because of this. They didn’t understand why the little Toddler kept showing up the way he did, knowing what was ailing them. Eventually, they started making sure their children kept their distance from him. Little Tycho became an outcast in the very place he was born in. Eventually, he stopped trying to make friends and played by himself. One day, however, was different. The Exchange got their hands on something that drew the attention of the Jedi. Jedi Knight Kedrin Edlan paid a visit to the village to retrieve the object, but the Exchange didn’t give it up without a fight. That day is forever seared in his mind. The Jedi had tried to be diplomatic about the object, not wanting the scene to get out of hand, but the Exchange had other ideas. Afterall, a Jedi sold to the right people can be lucrative. At the time, Tycho was minding his own business at his house when he felt it. A burning pain in his shoulder. The Exchange had opened fire on the Jedi, and a deflected blaster bolt hit one of the people of the Exchange right in the shoulder. The pain was worse than anything he had felt before, and he let out a scream that could be heard throughout the village. He could even feel the lightsaber, and the fear the Exchange feels. Eventually, his voice gives out and he’s just curled up on the floor of his house, feeling pain all over. His fear over it mixing with the fear of those who gave up their lives for a fool’s chance. At only 4 years old, little Tycho has felt something no one should have to feel. The Jedi had heard the scream during his fight, and sensed the distress the boy was in. After recovering the object he made his way to where the boy was, thinking the Exchange was attacking the boy. But what he found was just Tycho, with his parents trying to comfort him as best they could. Kedrin Edlan could sense the potential in the boy. Deactivating his saber, the Jedi approached them and did his best to soothe the boy as well, going as far as using the Force to try and calm him. Eventually, he settles down enough and falls right asleep. The Jedi takes the time to explain everything to the parents, and suggests that he takes him to Ossus, to learn from the Jedi to learn about himself, and what he can do. Wanting what’s best for their child, they reluctantly agreed. That same day, while he was still asleep, he was taken from his parents and to Ossus. He woke up, scared out of his mind over being in an unknown location with his parents nowhere in sight. The Jedi Knight Kedrin Edlan was there to explain the situation, and even took him to a place where he could talk to his parents. Eventually he settled, and began learning at the temple on Ossus. 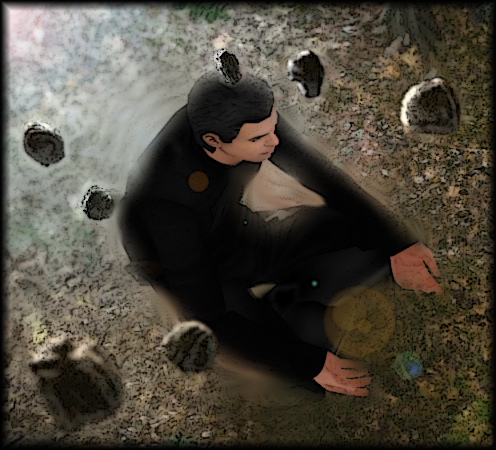 They taught him how to meditate, and try to focus his mind over the course of the next year, but all the distractions that were in a place like Ossus proved to be great. He would always feel the other students training, or people in the Medical room. He’d also feel the sadness of other children who were fresh to Ossus, missing their families. And like he used to back at his village, he’d tried to comfort the other sad people. While he was still wary of revealing that he just knows someone is upset, or hurt, he feels a bit better about it being around Jedi. Kedrin Edlan explained to him somewhat about Force Empathy, and while not all Jedi could use it to the level he can, a lot of Jedi can tell if someone is sad like he can. While undergoing his meditation training, one of the kids training their jumping Augmentation had an accident and wound up with a broken bone. Tycho felt it, and was practically rolling around on the floor holding his leg while in tears. Once the injured child was dealt with, Tycho recovered and one of the Knights talked to him in private. He was asked questions about his training, and how he felt about Ossus. It was then he admitted that sometimes he dreams about the night he was found, and that he constantly felt the jabs and blows of the students training in other parts on Ossus. The knights got together and judged it would be better for Tycho’s training if he was in a place that didn’t have as many students, a place that was calmer. And so, the Rannon Praxeum was contacted and informed about young Tycho Varga, and a couple days after his Fifth Birthday he was sent along there.